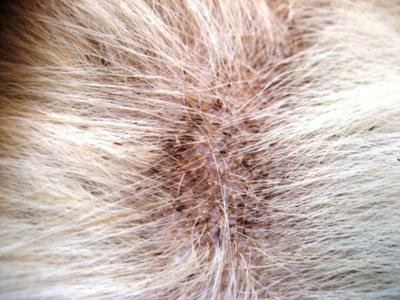 My dog is suffering from a skin disease and I am struggling to control it. I am living in China and due to the language barrier and available products; I am finding it difficult to eliminate the problem. This is the 3rd summer/fall that she has suffered from this problem. When the weather turns colder, the condition improves. Currently, I bathe her about every 2 weeks with Virbac Sebolytic shampoo and between baths; I apply ordinary white vinegar to the infected areas. She is also scratching her ears and I am cleaning them with Mystic Ear cleaner and Surolan ear drops. The ear drops expired last year, but I can't buy any new at the moment. Will the expired medicine help at all? I am concerned that she is getting too many chemicals and could have side effects. She is lethargic and also suffers from arthritis in her front legs. She is 7.5 years old Golden Retriever, 28 kg. I wasn't aware that seborrhea infections could cause odor, but sometimes, the dog does stink. I think she has some type of ring worm infection as there is a dark ring and little specks of dirt (looks like pepper) around the area. It usually starts around the neck and gradually spreads down the body. recommendations for me? Thank you very much. I don’t think ringworm is a likely cause of your dog’s condition because you mentioned that she gets better when the temperature gets cooler and because healthy adult dogs are pretty resistant to ringworm. That said, I can’t rule it out entirely without running some diagnostic tests. 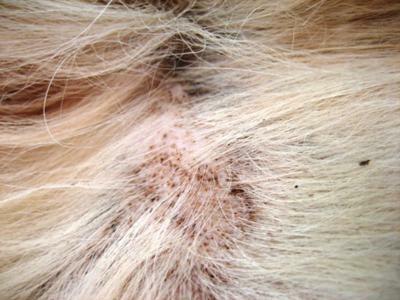 If I had to guess at what is going on (and that is all I can do without first performing a physical exam at the very least), I’d say your dog has allergies to something in her environment that is present in warm weather but disappears when the temperatures drop (e.g., pollen) and sometimes has skin and ear infections as a result. Seeing a local veterinarian is the best way for you to get a definitive diagnosis and have access to all your treatment options. If this is impossible at the moment, you can try a few things at home that might help and at the very least won’t do any harm. First, wash your dog weekly with a medicated shampoo that will treat any skin infections that might be present and remove allergens from the coat. Products that contain chlorhexidine are a good option. Applying Dermoscent or Duoxo Seborrhea Spot-On will also improve the skin’s natural defenses against allergens. My dog, a Siberian Husky 2 years old, looks like having the same problem, just it is not around neck, but only the rear side is affected(rear back and legs, not belly). I will take him to the vet tomorrow and let you know what he's got. Did you ever get an accurate diagnosis? My vet did skin scrapings and biopsy , still inconclusive.